If you are in Sweden and you take a good look around, you will certainly see tracks of beaver near the water. In and around the water there are pieces of wood and whole filed trees. Waterways have been closed by dams or there is an enormous lump of wood and mud, called the citadel. This builder does everything to make its shelter ready for the winter. 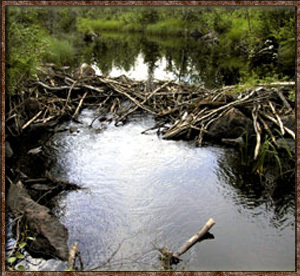 In the direct surroundings of the campsite in the Söralven river you have a chance of seeing a beaver. If you want a good chance to see a beaver it is wise to go out with a guide. In the twilight you will have the biggest chance of catching a glimpse of these large builders.